The Riviera Restaurant and Tavern near Gardner, Illinois, on Route 66 burned down Tuesday night, June 8, 2010. The fire is under investigation. One very pleasant evening on a July 7, 2006, Route 66 road trip, I had a post-dinner snack at the Riviera, met colorful people, and took the pictures I present here in memory of this Route 66 institution. The Riviera was built in 1928, though "assembled" is probably a better word as the structure was a hodgepodge of several buildings moved to the site. 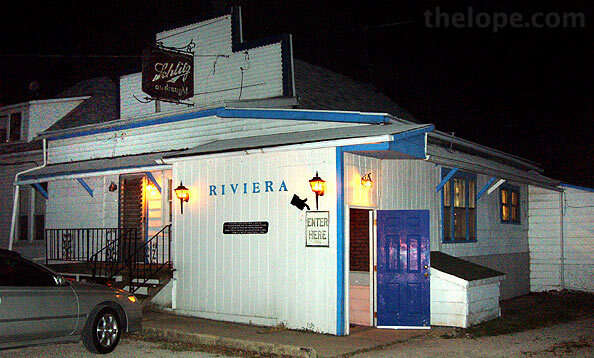 In late 2008 the Riviera closed when owners (since 1972) Bob and Peggy Kraft retired. The Krafts subsequently leased it to Bob Kelley who reopened it briefly in 2009. The building was reportedly vacant at the time of the fire. 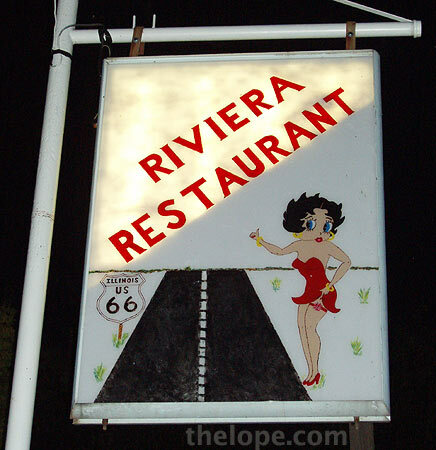 The era of Betty Boop...er, a figure suggestive of Betty Boop was a proper image for a place with a history steeped in prohibition and the defiance of it. I'll walk you through the place. The kitchen was upstairs and was originally a church building moved from another location. Down the stairs we went into the bar and restaurant, which we were later informed used to be the payroll office of a mining company. 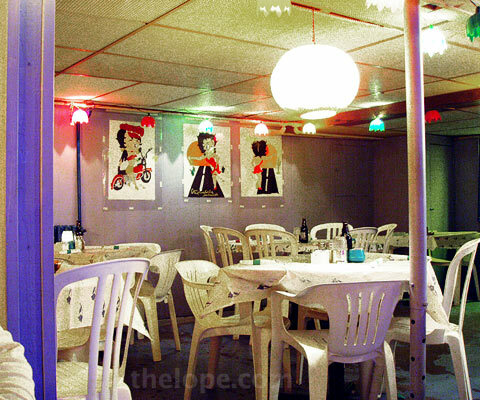 Betty Boop carried over into the seating area through a few posters. The Riviera was done serving most of it's locally famous food for the night when we stopped in, but we did have some nice french fries and a pop. 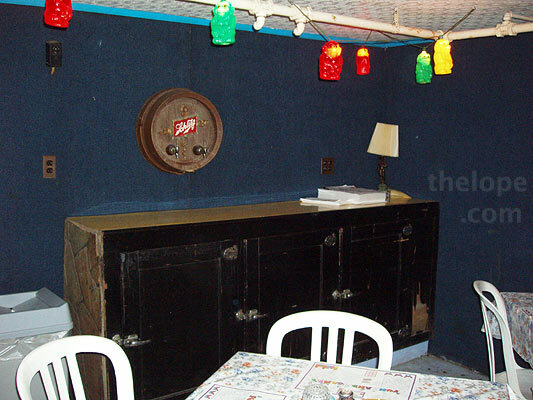 Colored lights and a textured ceiling helped keep the plastic lawn chair furniture from being too non-descript. What the main seating area lacked in the Route 66 roadhouse ambiance we expected, the bar and its bartender more than made up for. 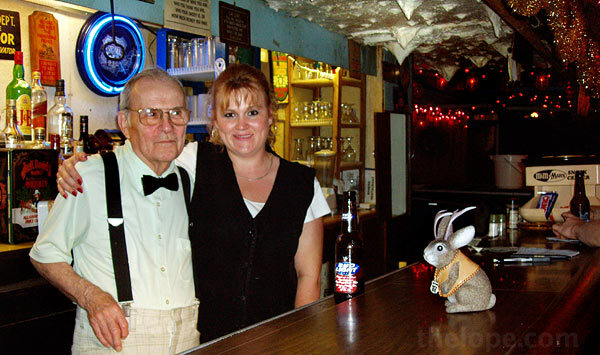 Owner and bartender Bob ("Bow tie Bob") Kraft was happy to show some of his memorabilia, including a picture of himself and a friend with a bar he once owned in Chicago. 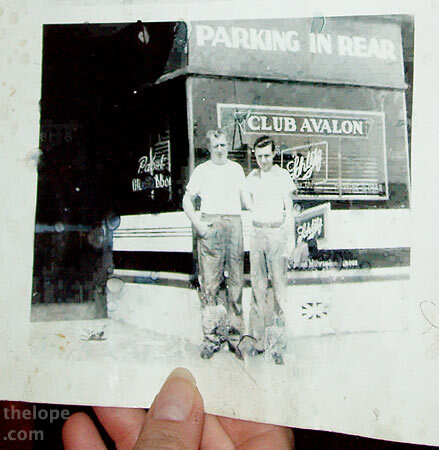 Bob (right) once owned two Club Avalon taverns in Chicago from 1947 to 1982 at 82nd and Dobson, and 79th and Luella. 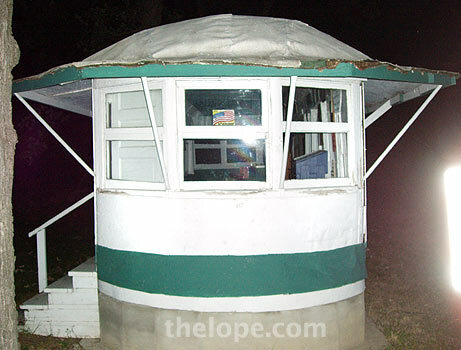 The one pictured was at 82nd and Dobson, he said. He met his wife at the other one. He says the man pictured with was named John Hughs. Bob shared that long ago his nickname was "Rapid Robert." 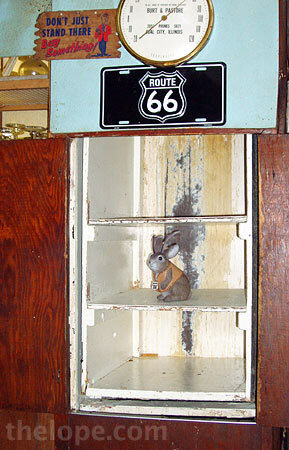 Ace hopped a ride on this dumbwaiter, which carries food from the kitchen upstairs to the bar and restaurant below. 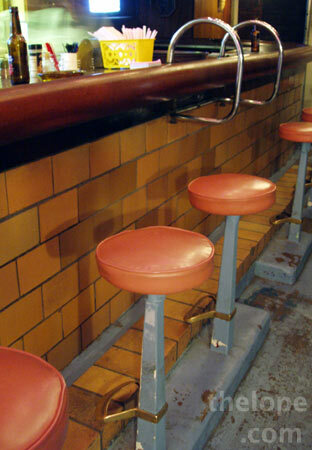 There weren't too many people when we stopped in, so I was able to shoot the bar front and stools. 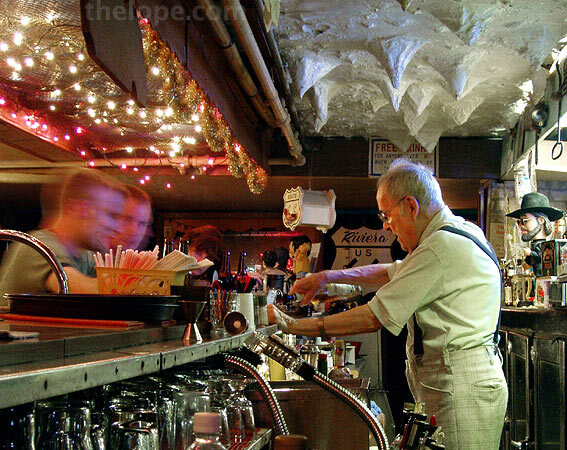 I later learned that the bar was formerly at one of Bob's Avalon taverns. 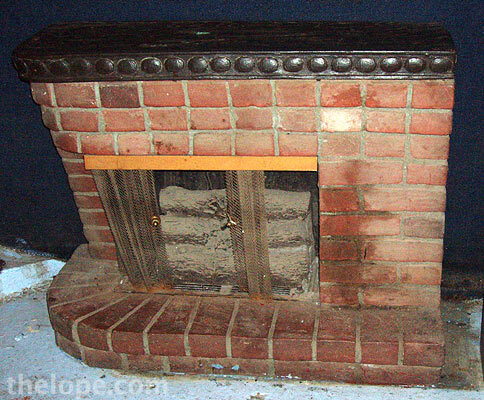 The fake stalactites, I was told, date from the 1930s or 1940s when there was a cave theme in the bar. 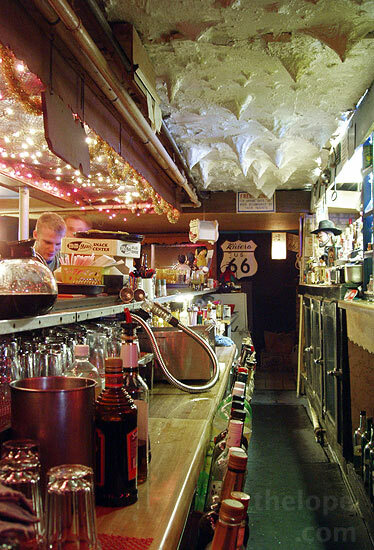 The ceiling above the bar was covered with netting and twinkle lights. 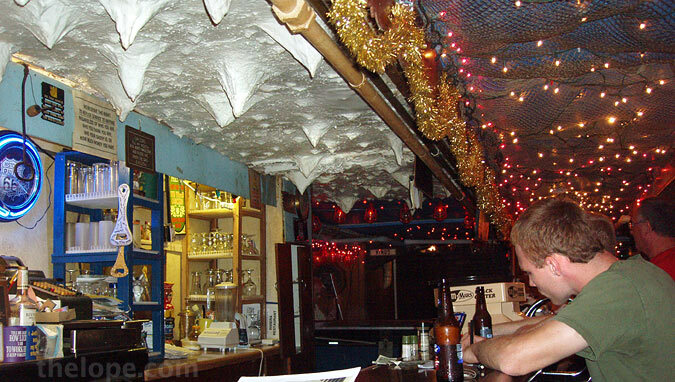 This place could so easily have been turned into a tiki bar. 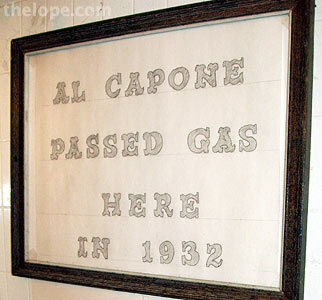 Copies of this restroom sign, "Al Capone passed gas here in 1932" were available at the bar. This refers to the local legend that Capone frequented the Riviera back in the day. 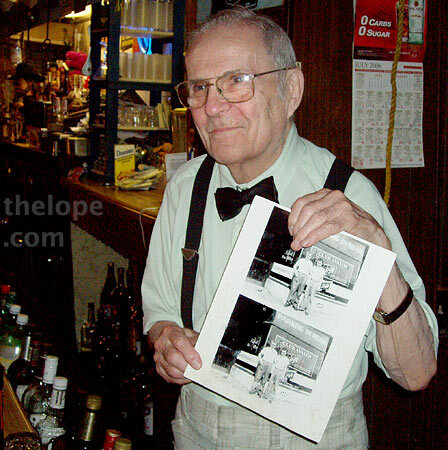 When I asked Bob if Capone was ever really there, he reminded me that prohibition was before his time at the Riviera. 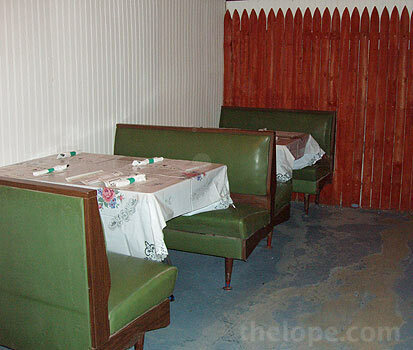 Gene Kelly and Tom Mix were also reported to have visited and the Chicago Sun-Times reported in 2008 that former Illinois Governor George Ryan dined here with his family shortly before he went to prison. Here's the restroom. The toilet was literally like a throne. Beckie Reed showed us around some more. Becky, a waitress at the Riviera, told me in a 2008 phone interview that she'd been working there for 23 years and started when she was 12 years-old. Becky showed us the old vault where Bob said "they'd lock up booze and slot machines when there was a raid." 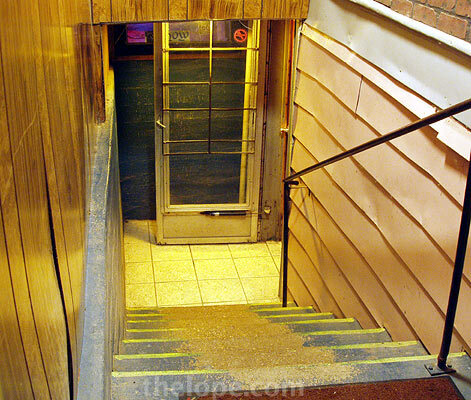 In the slightly labyrinthine interior beyond the bar, there were other rooms. I was told this one, with the fake fence, was called the terrace. 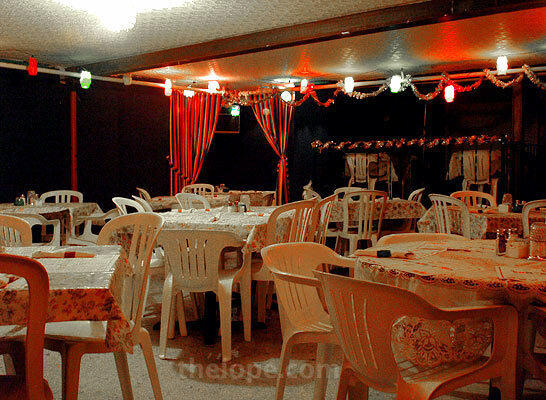 And this was the Safari room. See the monkey lights? Becky told me that in the back corner of one of these rooms they occasionally had a psychic, and that they used to have a drink called the tidy bowl. 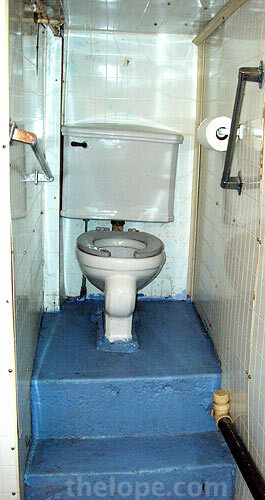 I didn't ask, but I suppose the drink may have been inspired by the notable toilet. Beside the building at a sufficient distance to spare it from the Riviera fire is a historic street car over a century old. It's a preservation project of the Illinois Route 66 Association. You never know what cool things you'll see or what nice people you'll meet when you decide to make just one more last stop of the day on a road trip.